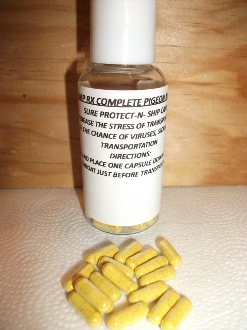 Our Products >> TRANSPORT CAPSULES 100 CT. MINIMIZE THE STRESS OF TRANSPORTATION, AND COMPROMISING THE IMMUNE SYSTEM!! DECREASE THE CHANCES OF YOUR BIRD GETTING DURING TRANSPORTATION! !